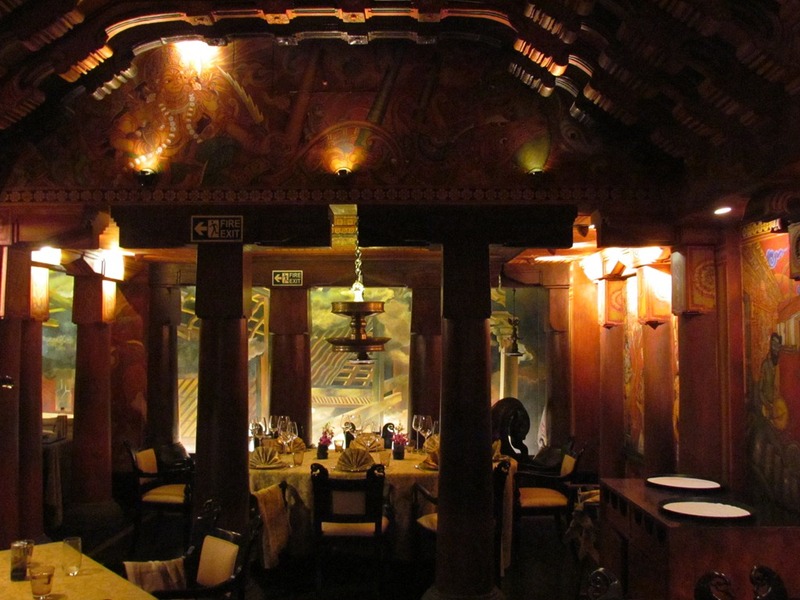 A Jaw dropping concept restaurant that took 7 years to make, immensely beautiful interiors with antiques & intricate traditional painting on the walls by artisans from faraway lands, excellent staff, a great place to spend an evening with some good to great (but not exotic) food at 5 star prices. 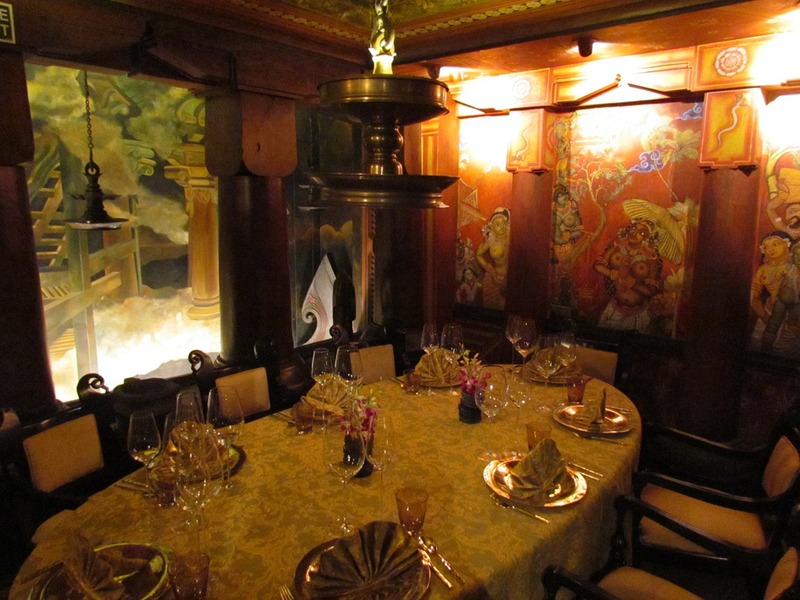 ‘Heralded as one of the top ten restaurants in the world by Condé Nast Traveler, The Spice Route is poetry in design. 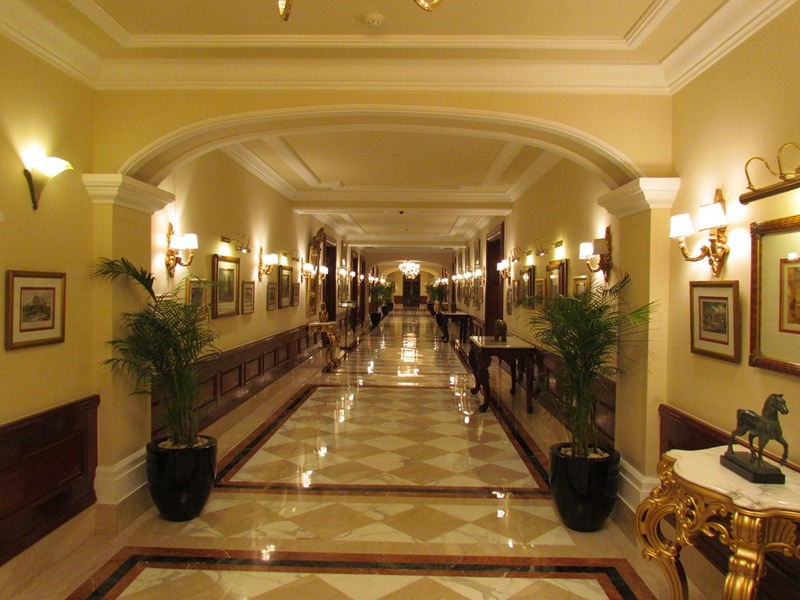 The renowned restaurant mesmerizes all your senses enrapturing you with its sensuous exotica. 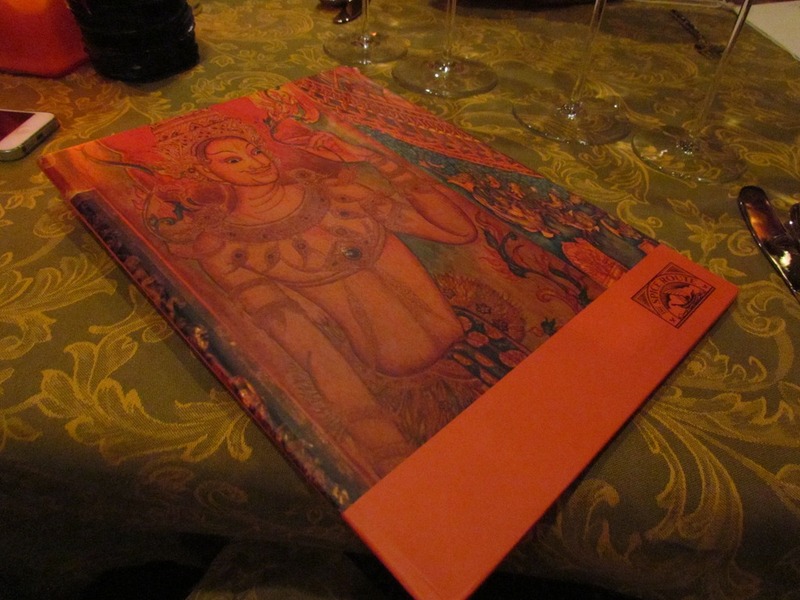 Designed by Rajeev Sethi, the celebrated cultural czar of India, The Spice Route reflects the journey of spices from the Malabar Coast in Kerala through Sri Lanka, Myanmar, Malaysia, and Indonesia to Thailand and Vietnam. 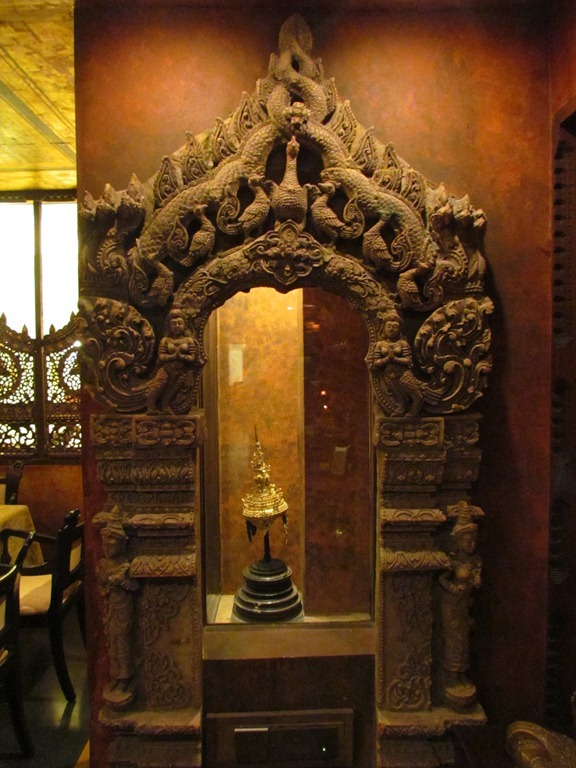 The restaurant is an overwhelming visual depiction of the art and culture that travelled with the spices through these regions, presented in a folk, religious and cultural fantasy of the Orient. 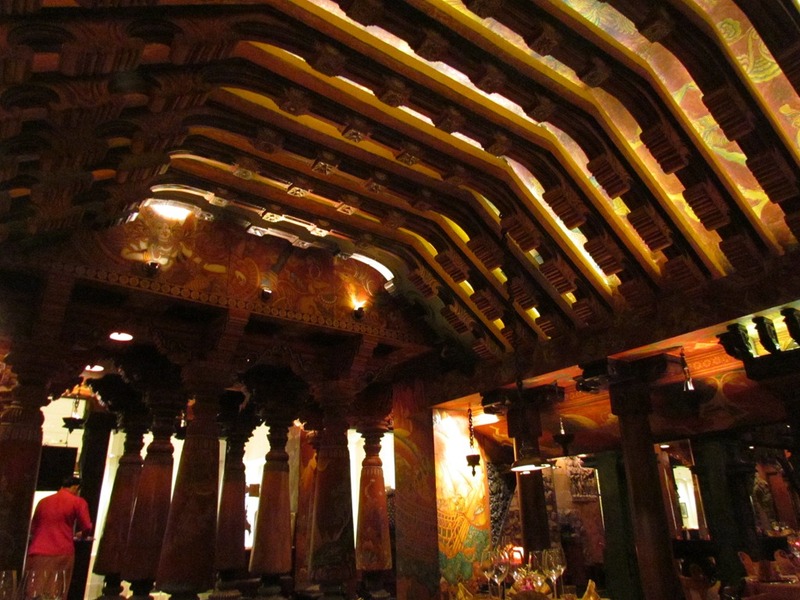 The Restaurant, that was seven years in the making, is completely hand painted with vegetable and flower dyes by mural painters brought in especially from a temple in Guruvayur in Kerala with a tradition dating back to 3000 years. 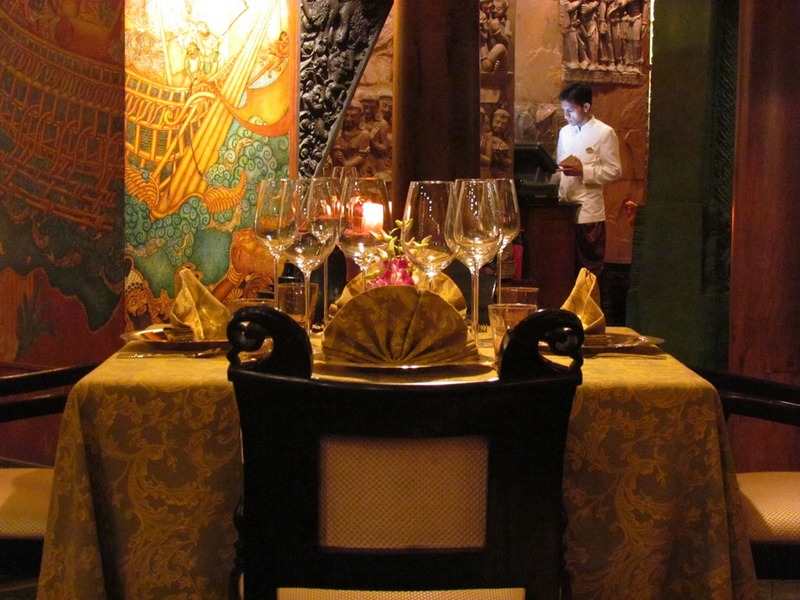 Designed on the principles of Feng Shui, The Spice Route is a treasure trove of antiques and is divided into nine different sections, each depicting part of the journey of life.’ – An excerpt straight out of the first page of the menu card. It was so nicely written that I thought I wud give u a taste of it. In case u r interested, Let me walk u thru some of the very interesting depiction of the different sections of life. 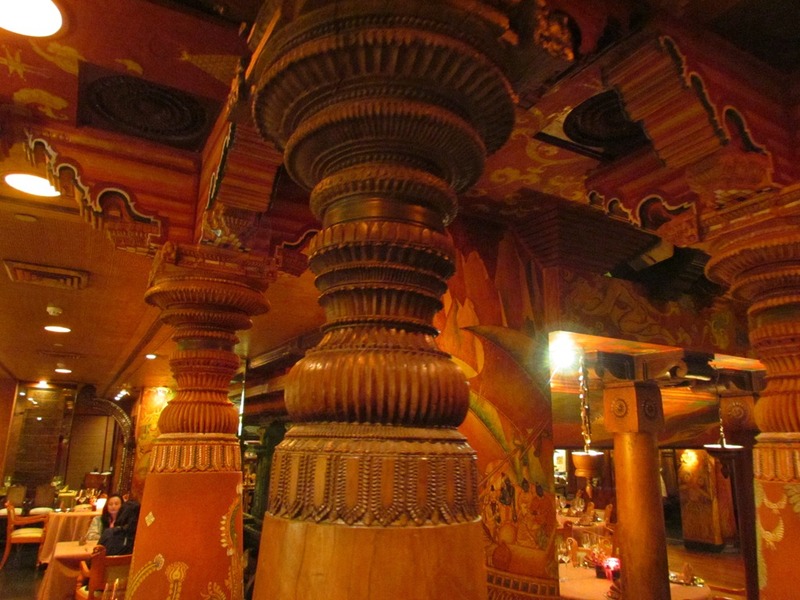 As we entered the restaurant, we came across 4 antique wooden pillars (from the temple mentioned above) & some other colorfully painted pillars that are replicas. The space between the pillars is less & hence we had to walk in one by one. We also exited the restaurant from here. This denotes the fact that we come into the world alone & leave this world alone. As we entered the first section, we saw a mythological painting that showed light. This denotes that we gather knowledge as we come to the world. On the walls & the ceilings there were beautiful intricate paintings that were drawn on the wall – some were showing moments of joy, harvest of crop, scenes from daily life including Kamasutra postures. 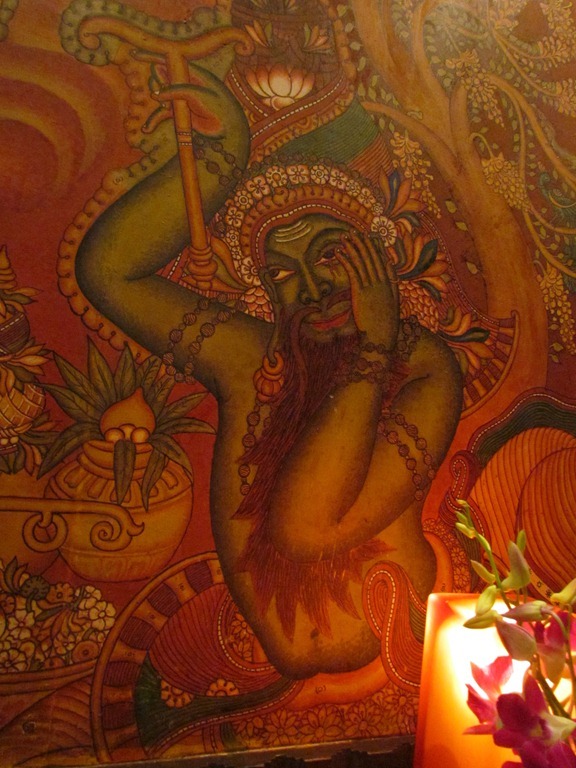 On the ceiling was a painting that depicted Moksha. However, there were wooden lintels that came in the way of seeing the picture. This denoted the fact that there are obstacles to attaining moksha. 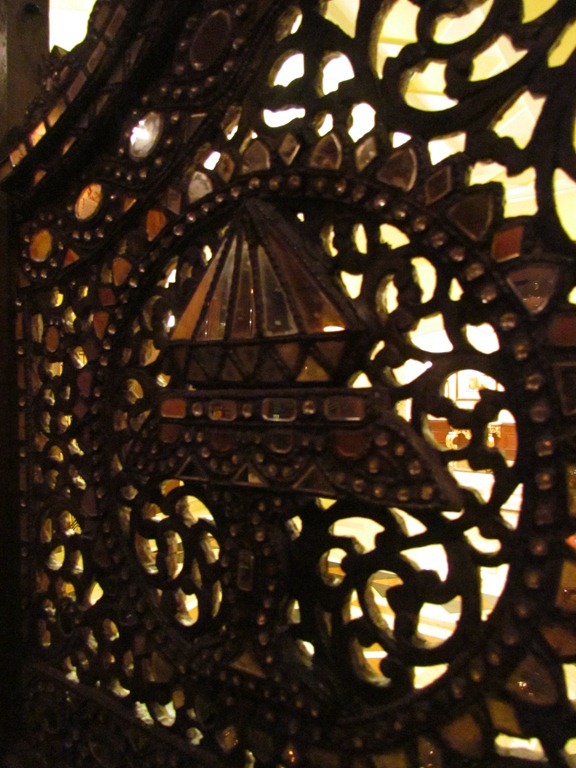 There was a family section where there was joint seating, a creativity section where there was an unfinished painting & some very creative interpretations of animals carved in wood, an intimate section where only 2 people cud sit together, an opulent cut glass decorated section that denoted prosperity & so on. 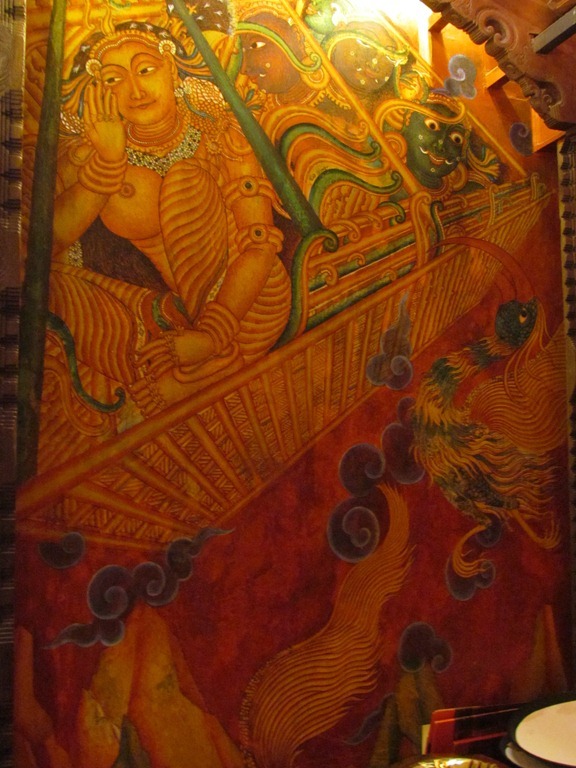 A wooden depiction of the boat that used to carry spices was also present. 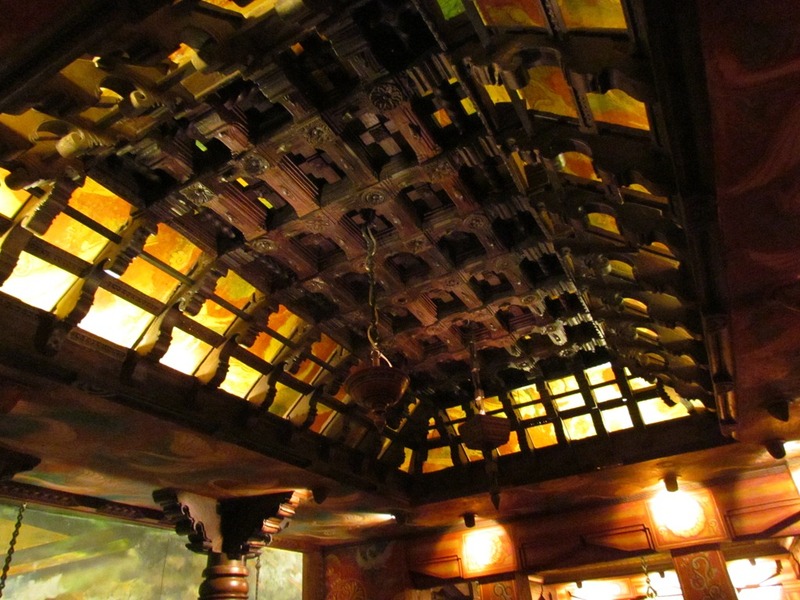 The area in the middle was very beautiful as well & it had Thai & Kerala style roofing. A painting of Goddess Annapurna was right beside the kitchen. Service as I mentioned was beyond expectation. Our guy made us feel at home & was very good at recommending dishes & answering our numerous questions. 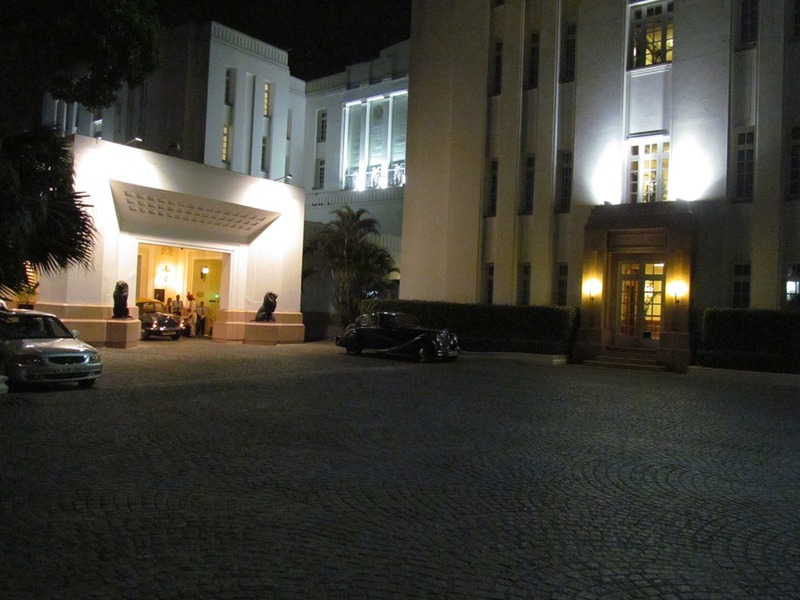 The restaurant is located in The Imperial, a hotel that opened a century ago as a part of Lutyen’s Delhi. So even after 6 decades of exodus of the British, the restaurant maintains the ‘British Gentleman’ code of dressing. I was refused entry on an earlier occasion coz I was wearing a ¾ trouser!!!! – Only full length trousers r allowed. Very dated , very gender biased – coz the ladies were allowed to wear the shortest of the skirts & pants!!!!!! Food was not exotic / to die for, but a depiction of good tasty food from the regions mentioned above. There was an option to go for a tasting menu with a little bit of many items. We chose the a la carte. Before the food arrived, they served us complimentary prawn cracklers with 5 kinds of sauces – soy sauce with chillies, Thai sweet chilli sauce,Plum sauce, Chilli Garlic sauce, onions chillies & cucumber in vinegar. We started the evening with Isso soup. It was Sri Lankan style spicy shrimp soup flavoured with fresh roasted coriander and chilli powder. The soup was just outstanding & I rate it 4.5/5. Strong, not too thin not too thick, it had a coconut milk base. The prawns were tasty, not soft , mildly chewy but enjoyable. 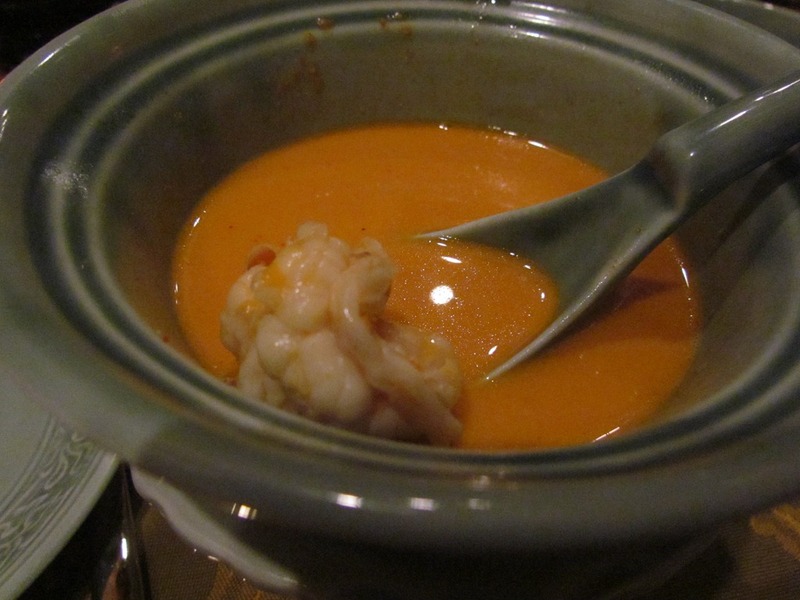 Soup was awesome in terms of aroma, taste, flavours & it completely refreshed me. Finished the soup till the last drop. For main course we had amba curry (Sri Lankan dish). It was a raw mango flavored vegetarian curry. Different veggies like cauliflower , carrots, broccoli etc. were used. 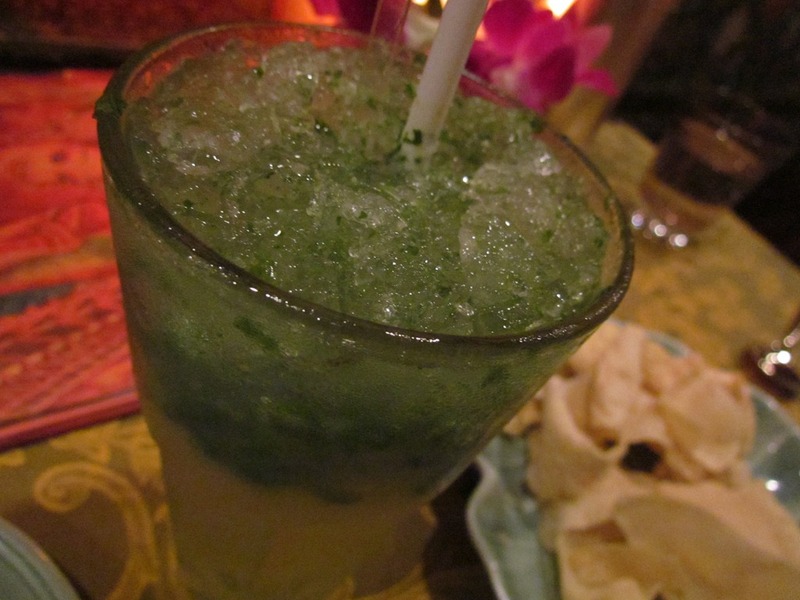 The sourness of the dish came from Raw mango & hence that added a twist of flavor. The level of salt was suboptimal & on sprinkling back a bit of salt, the taste was very good. Raw mango pieces were also present in this excellent gravy. Very very good for a vegetarian dish I must say. I rate Amba curry at 4.25/5 – wud have rated 4.5/5 sans the salt mishap.. The next dish we had was Marakkala kululmas. 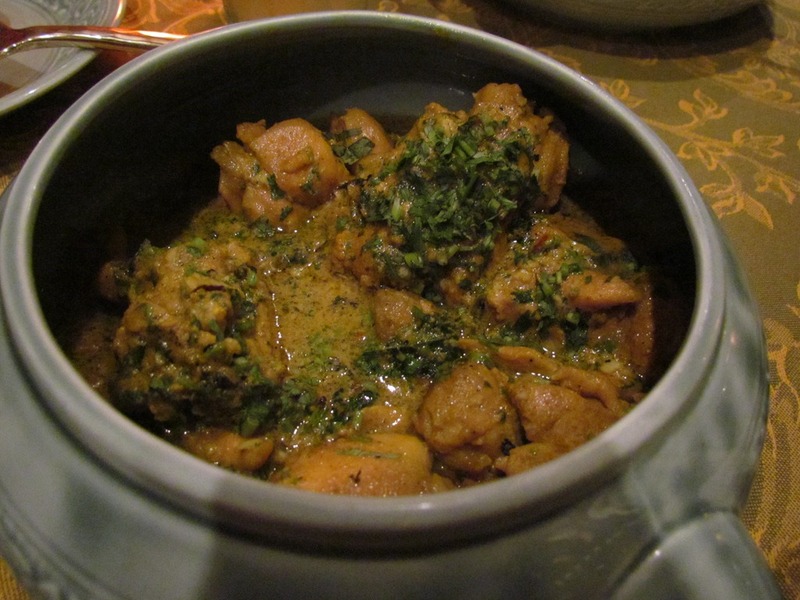 It was Sri Lankan style chicken flavoured with fresh yoghurt, curry powder & cilantro, simmered in coconut oil. The Chicken was somewhat soft but the strands were still visible. The meat was Boneless yet not succulent. Inspite of this, it was good to taste, but not great, mainly due to the gravy. It was spicy, somewhat hot, not very different from some of the South Indian local chicken preparations, had a slightly grainy texture & very good to taste. I wud give the chicken texture 2/5 & the gravy 4/5 – so overall rating of the dish averages out to 3/5. 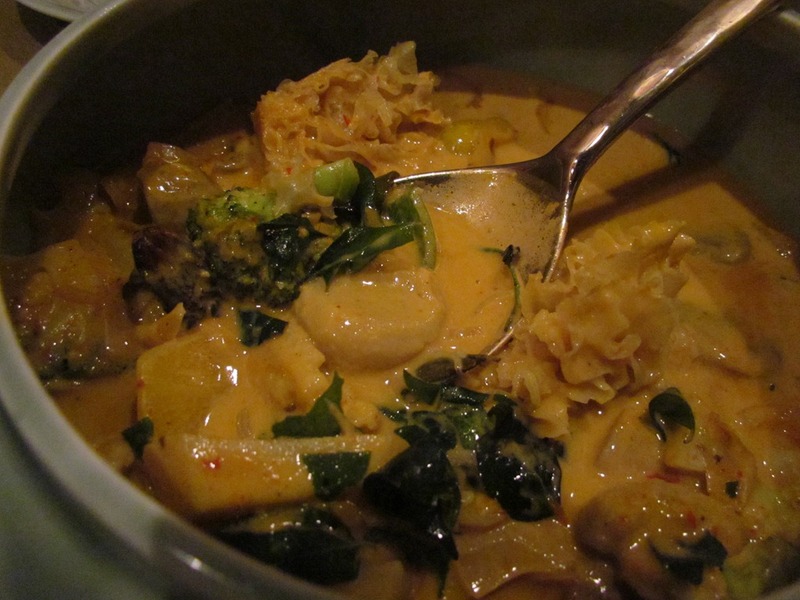 The last dish in main course was Thai dish Tom kang kho. 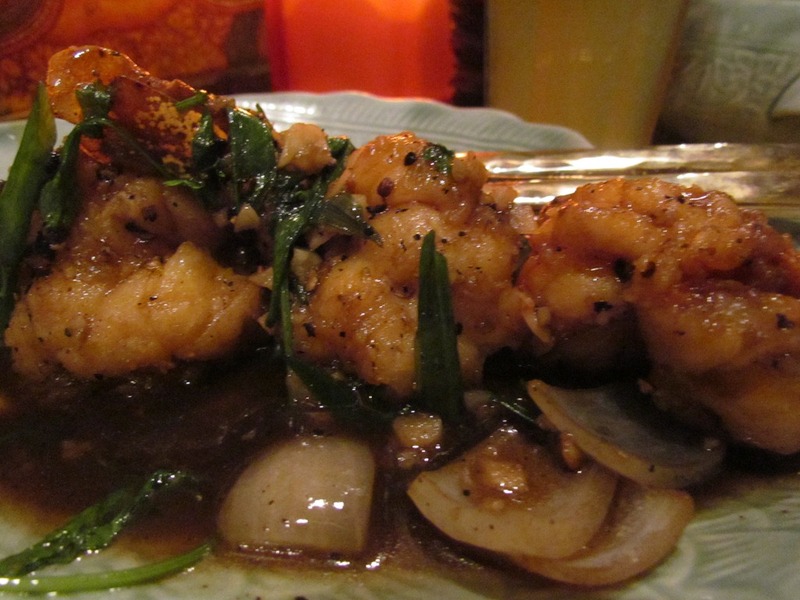 It was stir fried jumbo prawns with cracked peppercorn and cilantro. Very good gravy with cracked black pepper which means every time gravy enters mouth, so does good amount of pepper. Pretty authentic taste in terms of gravy. Flavor of cilantro was evident. The Prawns were huge in size but were thin coated & fried. I was told by another Chef at another time that since fresh prawns r not available in Delhi, this technique helps. 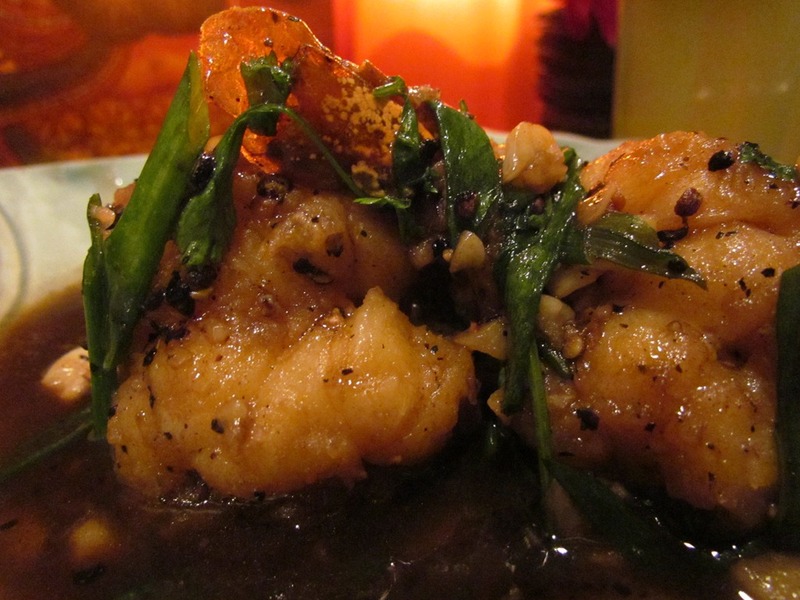 Two problems arore due to this situation – the prawn lost its softness & due to over cooking, lost its juiciness as well. Sub optimal execution of a good dish I wud say. From a taste perspective, the prawn was good though. I rate this dish a 3/5 on more or less same logic as the chicken dish. For dessert we ordered khanom saparos. 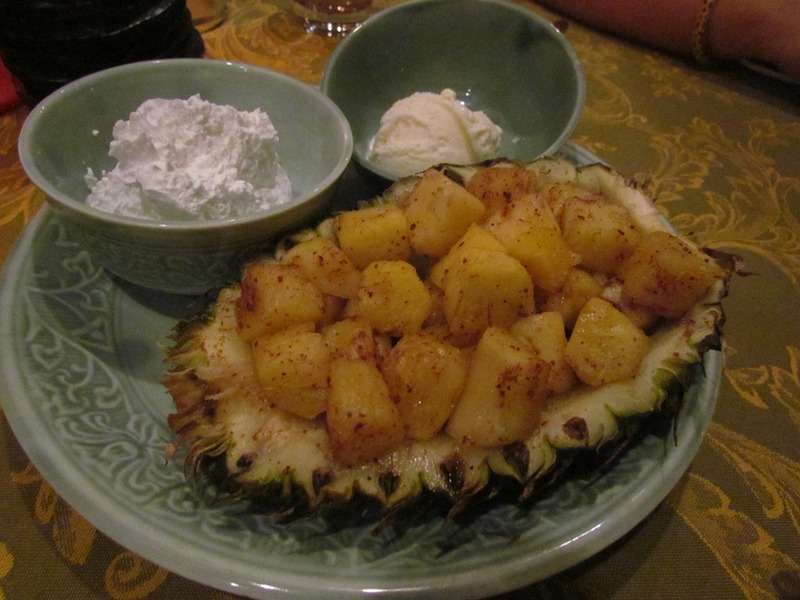 It was diced pineapple dusted with spices (cinnamon), served warm with whipped cream and vanilla ice cream. The Pineapple pieces were served on the pineapple shell (If I might call it that) itself. 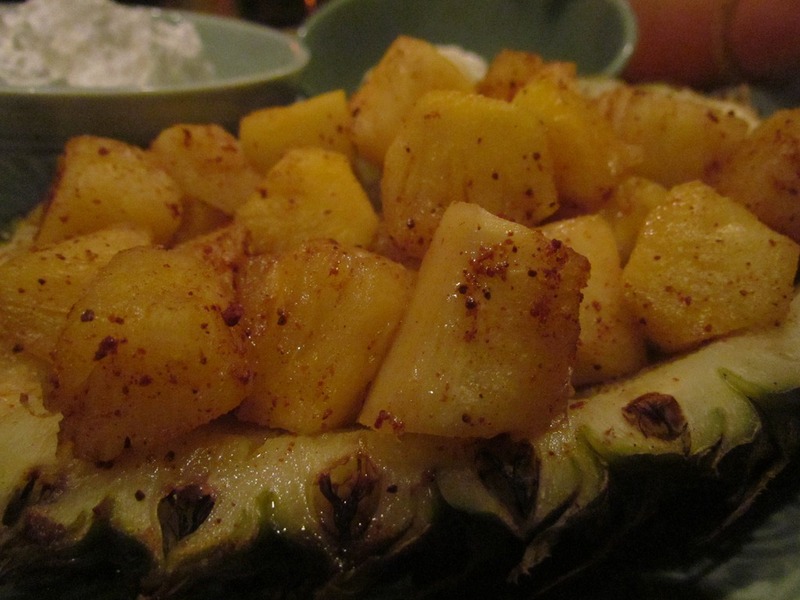 It was served hot, had a sweetness that perfectly balanced the tang of the pineapple. Cinnamon added a zing. I wud rate this a 4.5/5. We enjoyed the main course with Jasmine rice. 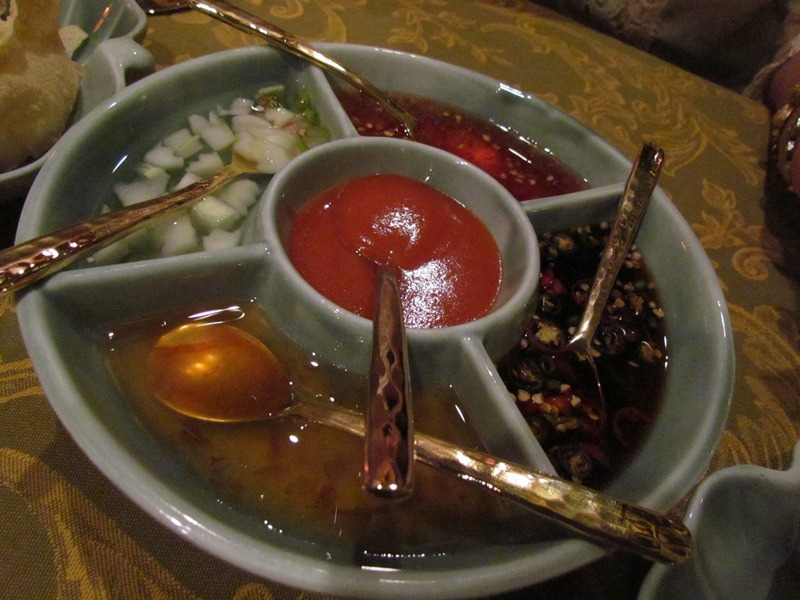 Rating of food at The Spice route averages out to 4/5. 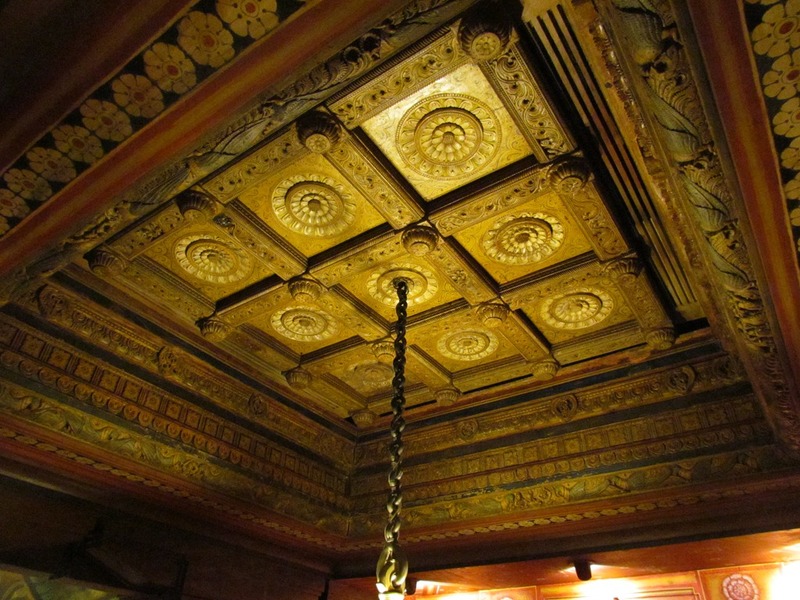 Antique ceiling from a temple in Kerala, now installed in the Family section – It is ivory carved. I wud go back here just to enjoy the place, to spend a nice evening with my best friend or to take a non Indian friend/colleague for a unique experience. I wud not go here just for the food. There r others in Delhi who do a better job on that front serving similar cuisine. oh my god! i simply love the passion you guys have for food. Specially your reviews – Excellent! !